Is it even possible for anyone to name a daughter Carol Anne anymore? It's completely synonymous with the adorably creepy little girl in footsie pajamas who made contact with the ghosts occupying her house, and most memorably the snow on her TV set in Poltergeist. While she was neither a killer, a monster, nor a victim, she's definitely earned her spot as a notable spooky presence in American cinema with the utterance of "They're heeeere." 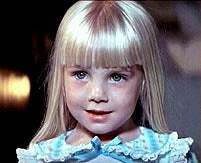 But maybe even more so because Heather O'Rourke, who played Carol Anne, died shortly after her 12th birthday, just months after wrapping principle filming on Poltergeist III. Her death is said to have been a part of the Poltergeist curse, that involves the death of four of the actors from the film (including Dominique Dunne) within six years of each other, and other weird occurrences on set.